Line a cookie sheet with parchment, wax paper or Silpat; set aside. In a small saucepan, bring cream and butter to a boil. Pour over chocolate and let sit for about 5 minutes. Stir thoroughly with a whisk until completely smooth. Stir in alcohol (if desired). Cover and refrigerate until firm. This will take a few hours. 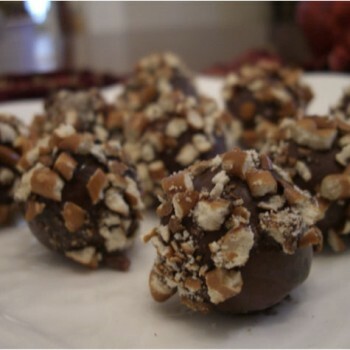 With a melon baller, or small spoon, scoop out an amount of chocolate that will roll into ¾” diameter balls. Roll in hands to form ball-shape. Immediately press into chopped pretzels and place onto prepared baking sheet. Refrigerate until completely firm – overnight works best.